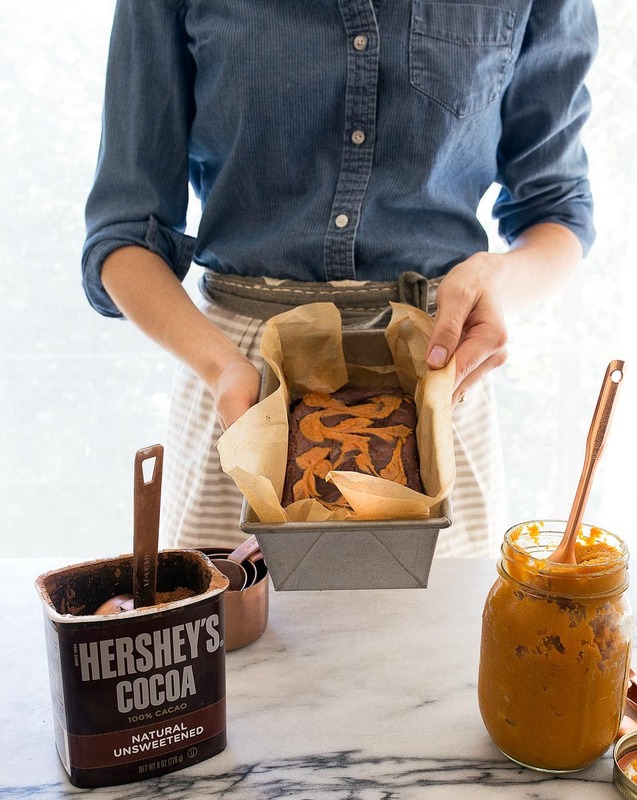 Pumpkin swirl brownies: I wrote this post in partnership with HERSHEY chocolate. It is a delicious, chocoately partnership, and I’m so glad to have them in my kitchen today. If we’re going to do Fall right, we’re going to reach for a can of pumpkin. We’re also going to have a heavier hand with spices and cocoa powder in general, because it’s the season for baking and I couldn’t be happier! You guys probably know this, but…I work really hard. I work every day of the week, and almost every hour of the day. As soon as I wake and until the last minute before I fall asleep, I’m doing some form of work. I’m constantly facing challenges in my career path, and I feel like I’m constantly dodging bullets, juggling new skills, and fielding new information. It’s overwhelming at times, yes. But you know what? I don’t really think of it as ‘work.’ People that are close to me say ‘you work too much,’ but I don’t really hear that. It’s true that I’m always plugged in, my brain is always in the creative space, and I’m probably on my phone too much. The thing is, it doesn’t really feel like WORK. It feels like something I am obsessed with and allowed to pursue with gusto. I would describe it as a love affair that shows no signs of slowing. A love that consumes me, fills me up, but leaves me begging for more. I love baking, I love photography, and I love writing cookbooks, so I would happily do it 24 hours a day. It never gets old to me; its allure never fades. I feel lucky that I get to fill the hours of the day with these things that make me so happy. There are times when I get overwhelmed and frustrated. There are times when I know I need to take a break, go on vacation, and turn off my phone. But do you know what I do when I feel that way? I BAKE. I get in the kitchen and bake. It’s technically still ‘work,’ but it has never felt that way. I bake small batches of desserts because it makes me happy, and I love that it doesn’t use too many ingredients. The fact that I can make something fabulous even when my fridge is bare and only contains 1 egg makes me giddy. I love that I don’t have leftovers, both for my waistline, but also so that I have an excuse to bake the next day, too. It’s almost indescribable why two brownies make me happier than 22. Or why six cookies make me smile more than three dozen. It’s just the way I’m made. I love that small batch desserts make you happy, too. But truthfully, if they didn’t, I’d still be here in this space, writing and sharing small batch desserts. If no one read my words or baked my recipes, I would still be here, baking two brownies in a loaf pan, but more specifically: pumpkin swirl brownies. One for me and one for you. (I would just have to eat your serving). I’ve had a lot of cool things come into my life because of my passion. Writing three cookbooks has definitely been the highlight, but I’ve also had a lot of brands come to me and ask me to use their products in my baking. And I have, here and there. I’m careful who I let into my space. I’m always guarding the door, making sure this job never becomes work. But when Hershey’s Kitchens asked me to talk about why I love baking, I let the door swing wide open. Their products are already nestled into my baking shelf in the pantry. Their love of baking is as fierce as mine. So, I wanted to let you guys know that for the next 10 weeks or so, I’ll be partnering with Hershey’s to share recipes that I’ve made exclusively for them. For making these pumpkin swirl brownies for two, I used their Natural Unsweetened Cocoa Powder (which already has a permanent home in my pantry). I swirled in pumpkin because Fall baking makes me happiest. I baked the pumpkin swirl brownies in a loaf pan for two large bakery-sized servings. And now I’m sharing them with you. If you’re here right now, you love to bake, too. Why do you love to bake? Is the kitchen your happy place? Why does your favorite whisk bring you such calmness? I’d love to share this passion with you even more. Is there a favorite recipe that you always turn to? Or, do you like to try something new? If you share your words here with me in the comment section, that’s incredible. But if you hop over to my Facebook page and share why you bake. Brownies for two made in a loaf pan...with a pumpkin swirl! Preheat the oven to 325, and line a 9x5” bread loaf pan with parchment paper, leaving enough excess to use as handles for lifting the brownies out of the pan when done baking. In a microwave-safe bowl, combine the butter, cocoa powder, 1 cup + 2 tablespoons of sugar. Microwave on HIGH for 30 seconds. Stop, stir, and repeat for another 30 seconds. Let the mixture stand for 1 minute. Stir in the vanilla, salt and egg. Finally, add the flour and stir vigorously for 1 minute, or so, or about 50 strokes. Next, combine the pumpkin swirl ingredients in a bowl: stir together the pumpkin, sugar, egg yolk and pumpkin pie spice. Spread the brownie batter in the pan evenly, and top with dots of the pumpkin swirl batter. Using a toothpick (or fork) to swirl the mixtures together. Bake for about 40 minutes—a toothpick inserted should have lots of wet crumbs clinging to it, but no wet batter. Let the brownies cool completely in the pan, lift out and slice to serve. I love this post so much! I haven’t been blogging as frequently, lately, but I still love having time to bake in the kitchen. The process is pure therapy and then being able to share something with others that makes them happy is the best (well, and enjoying the sweets myself too…). Now I feel like it’s extra special when I get to bake with L and teach him about something I have so much passion for. I love your recipes Christina because they are spot on perfect. Everything I bake comes out yummy because you have taken the time to do the work for us. I am constantly amazed that you bless us with your blog recipes and can also fill cookbooks of which I have two. Where does your inspiration come from to give your fans more and more new recipes. I love when you sneak in a few tidbits about your personal life. It does make us feel we are in your kitchen baking with you. Wow, Debbi thank you so much for the kind words. So desperately needed today. <3 I'm grateful to you. You just combined my two favorite desserts, these make me so happy! And I am 100% on board with baking as therapy, anytime I have a rough day at school baking cookies or brownies makes me feel better. Baking and Chocolate always make everything better. It fills the house with wonderful smells and put smiles on everyone’s faces. This post totally resonated with me… People tell me I work too much all the time, too, but to me, it’s not really work either; it’s just what I love doing! I want to spend time doing it (sometimes more than I want to hang out with other people… or sleep!). And I love baking because of the quiet time in the kitchen that I can be with my thoughts and creating new delights and flavor combinations that haven’t been experienced yet. 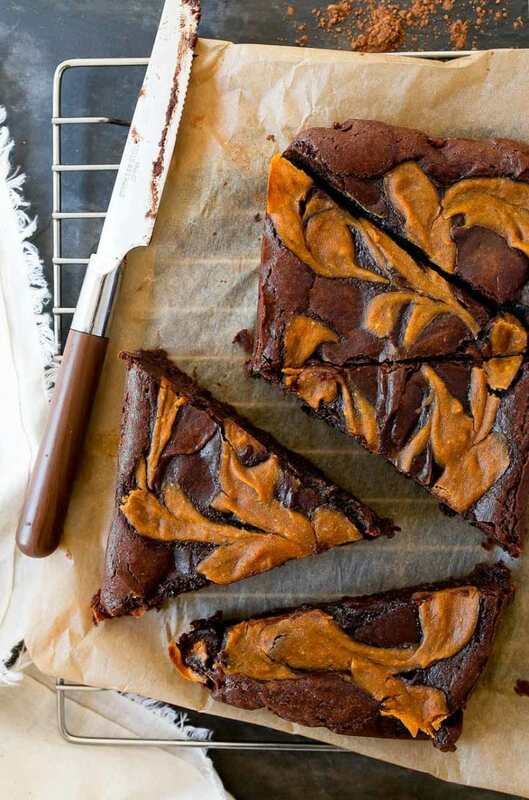 These Pumpkin Swirl Brownies are so incredibly perfect-looking!! These look amazing! I see in the description that the swirl is pumpkin cheesecake… But I don’t see cream cheese listed as an ingredient? Thanks… Can’t wait to try them! hey girl love the post! This looks so good! I love to bake to! Always have, my Mom was always in the kitchen when I was growing up. baking or cooking something else yummy! She taught me and my sister what’s what and me both learned from her! I feel you on so many levels here. Baking is so fun and so stressful all at once. Sure, I sometimes want to tear my hair out when a recipe keeps failing, but I love the challenge and getting the sweet reward at the end. And I love these brownies and all your small batch desserts. They are perfect for making for my daughter as a treat for school without leaving too many behind for me to eat while she is away! I notice there is no leavening agent here. No baking powder. No soda. How do these rise? Have some in the oven right now and they are just lying there. Hi CJ! So, most brownie recipes don’t have any leavening ingredients. This is why they’re dense and fudgy, as they should be. If a brownie recipe has leaveners, it ends up being a cake-y brownie. Maybe you want a cake-y brownie? I’m not sure. How did they turn out? I hope you liked them :) I love them! Do you still have a link to Amazon for the smaller size baking items you recommended. Gee I hope I remember this right. I did find your posting from March on the baking pans. I’m glad I did because I almost bought the 3 inch cake pan instead of the two inch and after reading the comments I now know to get two of them. So I’m planning on the 6 inch glass pie dish, quarter sheet, and the loaf pan. Do you prefer the regular metal–I was thinking the Wilton non-stick?? I’m retiring next summer, I’m single, and I’ll have time to cook so I bought your two cookbooks for smaller servings and not so many left over temptations. If there is something else I should get that will help me with your recipe size please let me know. I prefer metal 6″ cake pans, glass 6″ pie dish, and a metal loaf pan, though the loaf pan part isn’t that important. Thanks so much! If it were me, I would also buy some mini spatulas and mini whisks. It’s just easier when working with small amounts of batter. Totally not necessary, though! I hope you enjoy :) Thank you for writing! You’re killing it! Those brownies, those photos and that darling skirt! I love it all. I just made the brownies. They didn’t taste right then realized your directions forget to say when to add the additional cup of sugar in the brownie part. You only list the 2T. You might want to repost the recipe. Gosh, I’m sorry. I just totally misread the recipe. It clearly states to add all the sugar with the cocoa and butter. My mistake. Guess I shouldn’t try and bake something new when I’m watching a presidential debate! I’ll try again. I am so happy I already pre-ordered your next book! Do you have a recommendation which one I should be using for the fudgiest ones? I have tried the small batch brownies from your book and the perfect brownie recipe from your website. Any advice on getting the ultimate fudgiest brownie recipe would be greatly appreciated!! However, if you don’t want to make brownies with beer, I would suggest the pumpkin swirl brownies and leave off the pumpkin swirl. 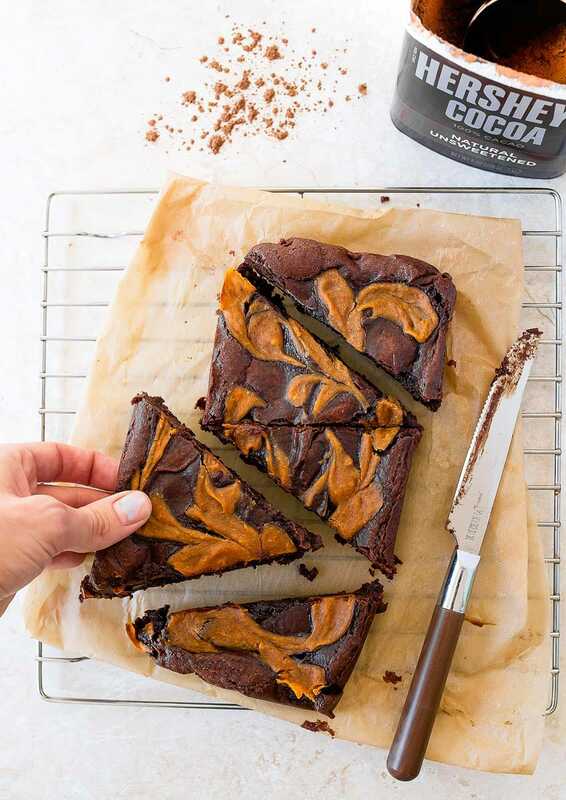 The next book (Sweet & Simple) has a frosted brownie recipe that is so thick and fudgy, it makes me weak in the knees! :) The pumpkin swirl brownies on the site are the closest to the new brownie recipe in the next book. Thanks again for writing, and I hope you continue to enjoy small desserts! These look delicious! I was wondering why the sugar is double your normal brownie recipe? My husband and I love sweets, but cannot tolerate too much sugar. Is it possible to use the 1/2 cup plus 1-2 tablespoon amount instead? Also, will you ever give a recipe for a more cake-like brownie? 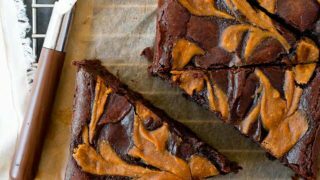 Good eye–yes, this recipe has way more sugar than my normal brownie recipe. I did this because I wanted thicker, more substantial brownies. I would use the old brownie recipe (found here: https://www.dessertfortwo.com/small-batch-brownies/), and add the pumpkin swirl on top of that. Mmmm these brownies look SO good. We’ve got some Hershey’s cocoa powder in our pantry too. Great stuff! I define work as something you don’t want to do. I am not averse to the heavy manual labor of digging, cultivating and weeding my garden and I can cook for hours but never think of it as “slaving” over a hot stove. Thanks for your brownie recipe- it is top notch. Cooled cut up and eaten in less than an hour. Will have to do it all over again tomorrow. btw, I used steamed butternut squash in place of the canned pumpkin. What pan would you recommend if I want to double the brownies for a bigger batch? I have some pumpkin that I roasted and need to use up, would you recommend purée it first? If I don’t have a microwave should I melt butter and chocolate over a double boiler? Thank you! I love all your recipes and your style.